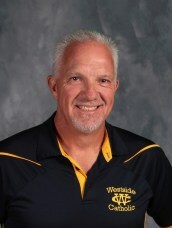 Steve Ricketts has been teaching at Westside Catholic for the past 26 years. He began his career at Westside Catholic teaching sixth grade, where he specialized in Science and Language Arts. For the past 12 years he has been our Physical Education and Health teacher. Steve also shares his talents at Mater Dei High School where he serves as the varsity baseball coach and assistant football coach. Both of his sons, Easton '08 and Cooper '11, are both graduates of Westside Catholic. Steve and his family are members of St. Boniface.